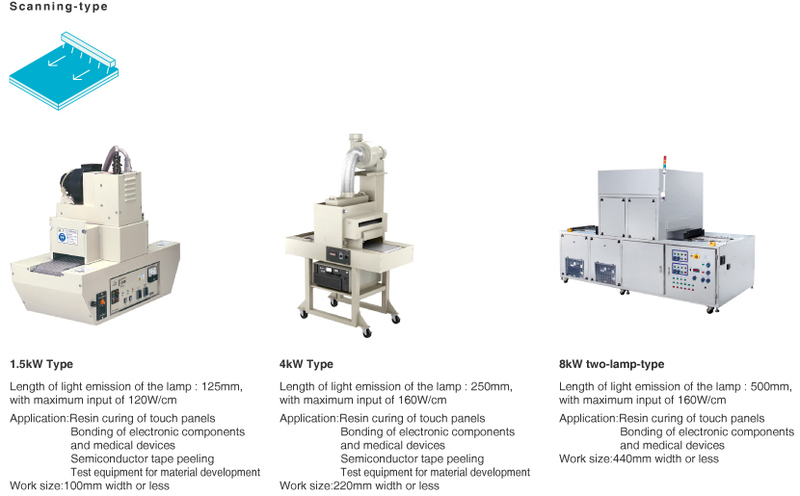 UV instant curing equipment Unicure System | USHIO INC.
High-power, compact UV curing and drying equipment achieves low-temperature processing. 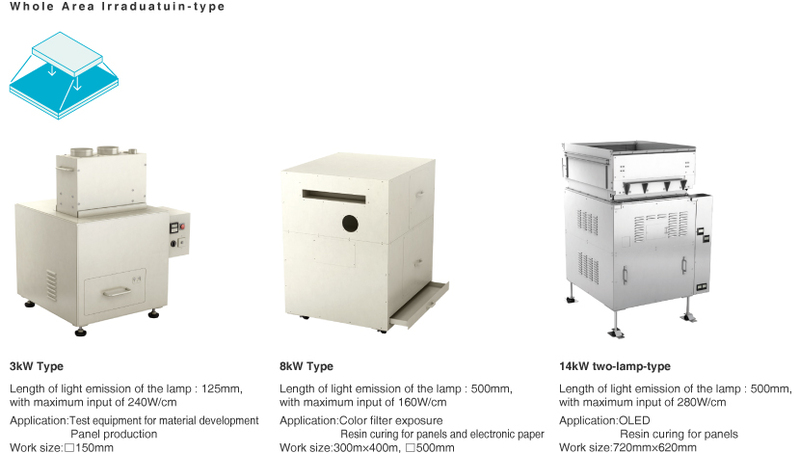 Lamps and other components can be selected according to the UV intensity and irradiation area required for the intended purpose. UV curing can finish processes in a matter of seconds that would otherwise require many hours of heat curing and drying. Because UV does not radiate much heat, curing and drying can be done without heating the irradiated object. Curing and drying can be applied to thermally sensitive materials (such as plastics, vinyl and paper) without deformation or deterioration. Mainly consisting of the light source (UV lamp) and optical components such as mirrors, no large heating furnace or equipment is required, saving space on the shop floor. As no organic solvents are used, there is no need to worry about toxic gases or water contamination, and no soot or smoke is generated. Curing, drying and bonding by UV light is an environmentally friendly technology. System variations of UV intensity and irradiation area can be chosen as needed for the intended purpose. Select the UV wavelength according to the curing characteristics of the resin. There are two lamp types: high-pressure UV and metal halide Opposing electrodes are mounted at each end of the arc tube sealed with a noble gas and mercury. 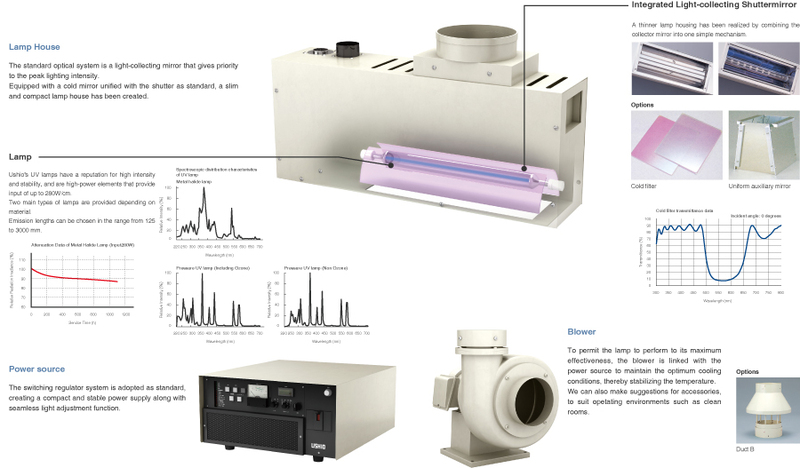 High power produces strong continuous emissions from deep UV to visible light, featuring high illuminance. Metal halide lamps are used for bonding sandwiched objects and for drying ink. High-pressure UV lamps are used for clear coatings and hard coatings. Select an ozone-less lamp if using in an environmentally controlled location. Unneeded wavelengths can be removed by various filters. 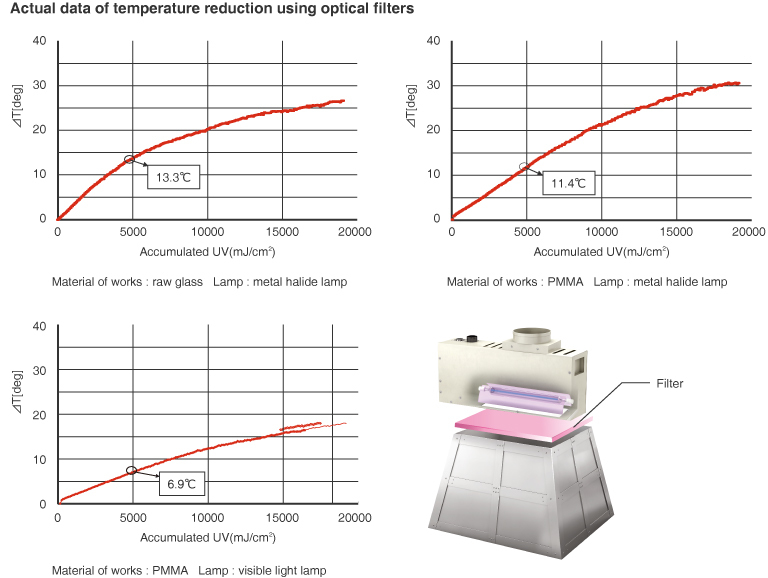 For scanning irradiation, select a lamp that has a 10% longer emission length that the irradiation width. 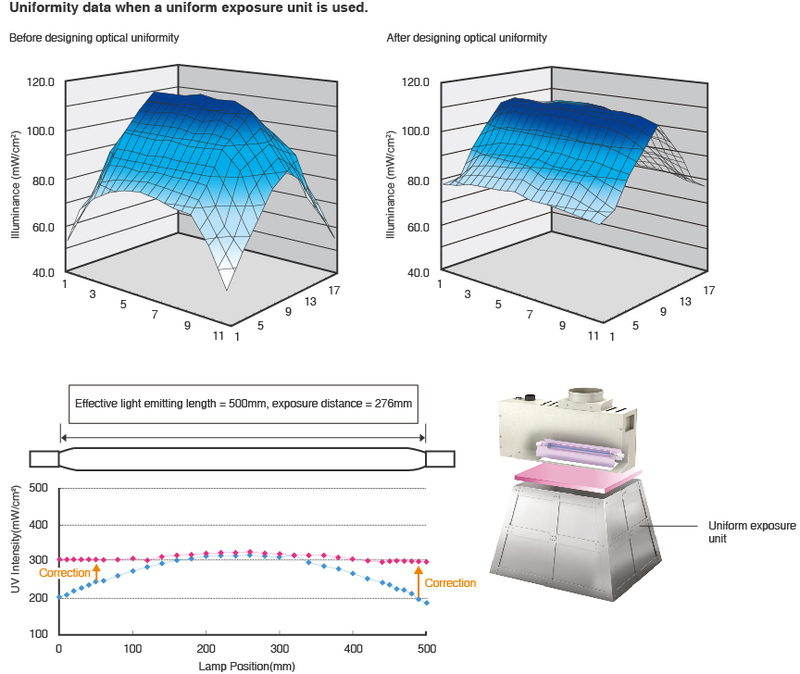 Uniform irradiation is available. Contact our representative to determine whether the required illuminance can be obtained. 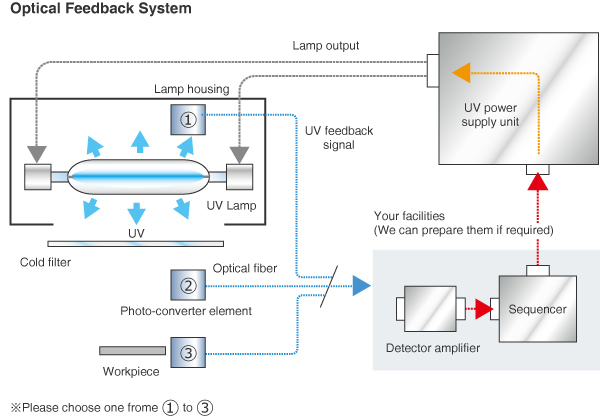 Select the lamp output according to the the necessary UV illuminance. 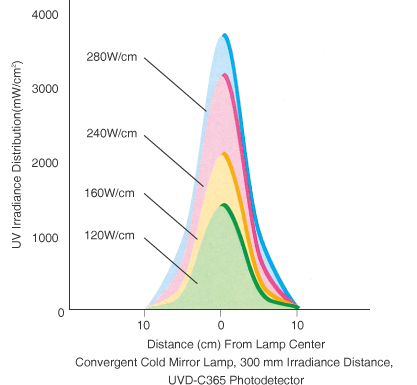 Lamp output is represented by input power per cm of lamp emission length (W/cm). The same lamp can provide different power output according to the power supply unit used. A switching regulator is employed to support stepless variable dimming. UV-curing resins are photosensitive agents that instantly harden, dry, or bond upon irradiation by ultraviolet light. Curing, drying, or bonding of materials coated with such resin is possible by irradiation with ultraviolet light of wavelength short enough to induce a chemical reaction. From its application in UV curing, drying, and bonding technology, this technique is referred by names such as "light hardening" and "UV curing." Since the introduction of this UV curing technology in the Unicure line of ultraviolet instant drying equipment in 1974, it has been practically employed in printing applications such as for stickers and labels. Since then, applications for UV curing have expanded into a wide variety of production fields, including hardening of paints and surface coatings, attachment of precision components such as semiconductors and optical components, and bonding of LCD panels, as well as in nanotechnology, biotechnology, fuel cells, and photovoltaic cells. Photo-alignment equipment is primarily used in the production of liquid crystal displays. This equipment uses linearly polarized ultraviolet light to apply anisotropy to the alignment layer and arrange the liquid crystal in the required orientation. The equipment uses short arc lamps (super-high pressure mercury lamps) and long arc lamps (high pressure mercury lamps or metal halide lamps) as light sources. 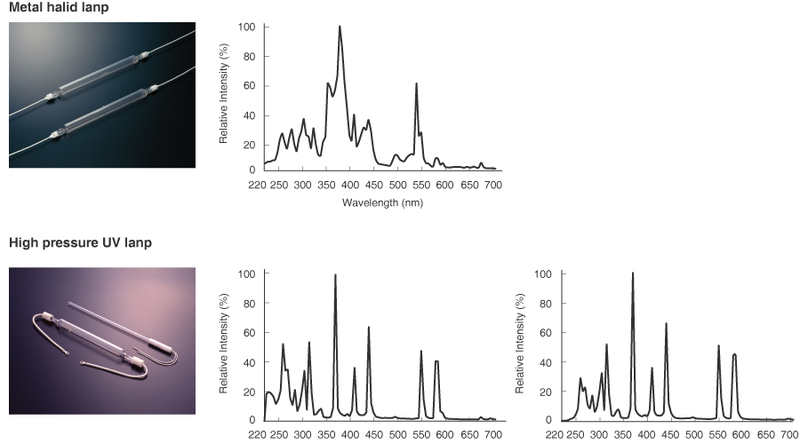 Use of linearly polarized light to align liquid crystal allows alignment to be conducted in a cleaner environment than was possible with former methods of alignment such as rubbing. The UV photocuring equipment used for bonding of LCD panels makes full use of the technique of UV curing. In LCD panels, the liquid crystal is sealed between two sheets of glass, but the liquid crystal has a delicate chemical structure that cannot tolerate the use of heat to harden the adhesive used to bond the pieces of glass together. The method used to deal with this in the past was to bond the two pieces of glass together in advance, and then inject the liquid crystal through a gap left open for the purpose. However, the larger the LCD panel, the more difficult it becomes to quickly achieve uniform distribution of the liquid crystal between the sheets. To resolve this problem, an innovative method of dropping the liquid crystal directly onto one of the glass sheets and then bonding the second sheet of glass to the first came into use starting from about the year 2000. This new method is called the "one drop fill" (ODF) method. The fundamental technology on which the ODF method is based is UV curing, which allows rapid curing, low-temperature processing, and precision bonding. 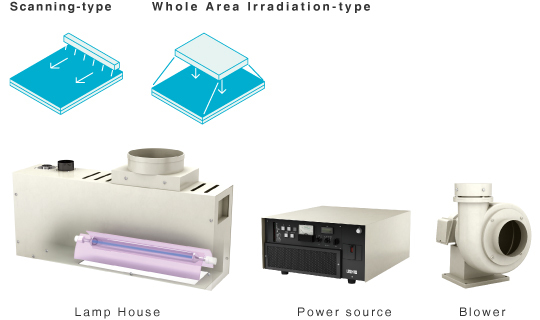 Today, UV irradiation units made by Ushio for bonding of LCD panels have a 70% world-wide market share. Matter is composed of molecules, which are combinations of atoms such as oxygen, hydrogen, carbon, and nitrogen. Ultraviolet light is capable of breaking the bonds that tie these atoms together. Once atoms have been broken loose, they naturally tend to form bonds with other atoms. Atoms that are left over then tend to form bonds with other atoms, and atoms that are still left over also go on to form bonds in a chain reaction that rearranges the atomic structure of the substance (a phenomenon called a light polymerization reaction). The resulting change in molecular structure of the plastic, rubber, etc., appears as changes in properties such as color and hardness. "Light curing," or "UV curing" takes advantage of this reaction by combining ultraviolet and resin that hardens when exposed to ultraviolet (light curing resin). The resin is initially in the form of liquid or paste, but instantaneously changes to solid by photopolymerization reaction upon exposure to ultraviolet light. This makes it possible to use the reaction to dry ink or to bond components together. We provide a lamp housing, power supply and blower. They can be incorporated into a system or a production line. 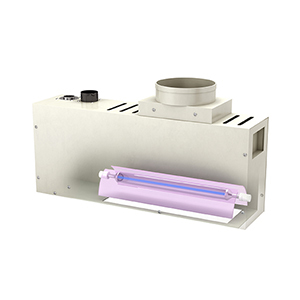 The UV curing system integrates a conveyor with the lamp housing, power supply and blower. Conveyor speed and irradiation distance are adjustable. It is useful in various research and prototyping applications, as well as for mass production. Just place a workpiece on the stand and press the irradiate button for uniform UV irradiation. A timer can be used to set irradiation time. 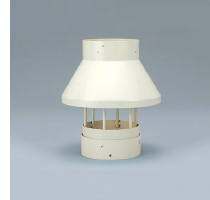 The lamp housing integrates a uniform irradiation unit in a light-shielding enclosure. UV irradiation is applied in a narrow area. This is used mainly for fine mounting processes and provisional fixing. UV illuminance is always monitored automatically to avoid falling below the setting. Input is auto-adjusted by feeding back monitored information to the power supply to maintain constant illuminance. 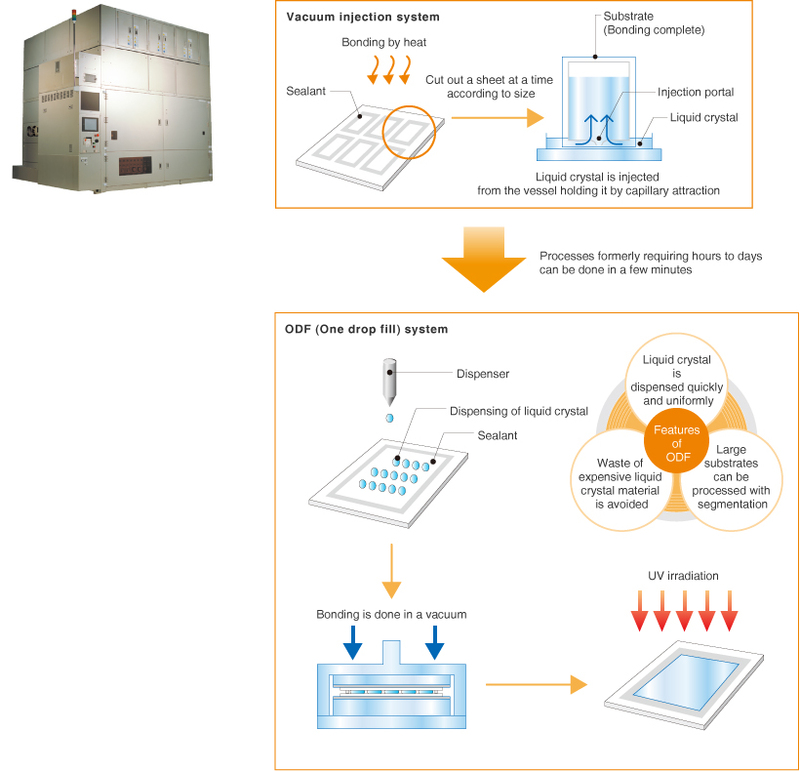 Consumption of the cleanroom's precious clean air is prevented. 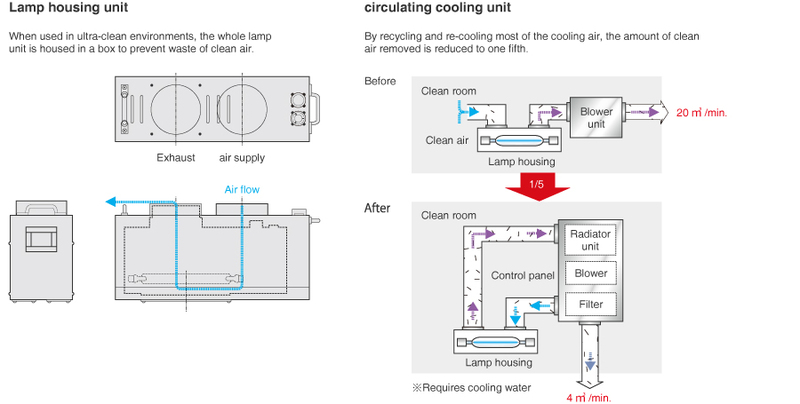 Almost all cooling air is re-cooled and recycled. If the customer's duct bank has strong negative pressure, the lamp may fail to light due to over-cooling of the lamp housing. 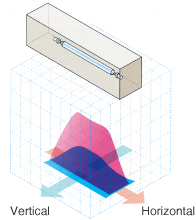 In this case, the lamp can be properly cooled by adding a "B duct" to relieve the negative pressure. Does use require light blocking? Be sure to use ONLY with light blocking. Light leaking from the irradiation aperture can cause eye injury or skin damage in a very short time. When working in the vicinity of unshielded light, be sure to wear eye protection and make sure that the skin is not exposed. Never look directly at the light. How should the lamp be disposed of? The lamps contains mercury, which is a hazardous substance. Only dispose of them in accordance with directives established by authorities in your region.